We are confident you will love your stay! 2019 has begun to book.... NOTE: 2019 weeks are open, contact us for the current rates!!!! CONTACT US TODAY ABOUT GREAT LAST MINUTE RATES!!! All Inclusive Rental Fee - All Inclusive INCLUDES ALL TAXES, COMPLETE BED LINENS, BATH TOWELS and DEPARTURE CLEANING FEES AND 2 CHAIRS AND UMBRELLA AT THE BEACH FOR ALL RENTALS BETWEEN MEMORIAL DAY AND LABOR DAY! I am always available for personal assistance when booking your Sea Watch Plantation vacation, please contact me to receive this owner's personal attention. Our unit is oceanfront on the 3rd floor of the North Tower and is the only 3 bedroom / 3 bathroom unit on the 3rd floor. You can shop to your heart's content at the Tanger outlet mall within a mile; visit Broadway at the Beach or Barefoot Landing or simply stay at the Resort with its many amenities and daily activities. Float in the lazy rivers, enjoy a swim in one of the large outdoor pools, relax in one of the ten pool side heated Jacuzzis or just lounge pool side with the Tiki-Bar waiting to serve your favorite cold beverage. Having worked up an appetite you can head to the Captain Cove's on-site restaurant for a delicious meal while taking in the magnificent view of the Atlantic Ocean. You can also visit the many nearby restaurants lining Restaurant Row within just a few minutes’ drive. Even when the sun goes down, the night life heats up at the beach. Visit popular Celebrity Square at Broadway at the Beach with such clubs as Crocodile Rocks Piano Bar, Revolutions, Malibu's Surf Bar, Senior Frogs, Fat Tuesday's and more. You can also visit Club Kryptonite, House of Blues, or 2001 Club a dance club with three dance floors and a live band just one mile away from the resort. The MASTER BEDROOM boasts a large king-sized bed with a new pillow top mattress, flat screen TV, DVD player, private bathroom and its own oceanfront balcony. Kids or adults will enjoy the large, SECOND BEDROOM with two double beds, also with new pillow top mattresses, and a 40" flat screen TV and DVD player. The THIRD BEDROOM is furnished with a queen-sized bed, flat screen TV and DVD player. In addition, the living room sofa converts to a queen-sized bed enabling the unit to sleep up to 10 people. KITCHEN: The large fully equipped kitchen (pots/pans, silverware, utensils, plates/bowls & cups, etc.) includes a dishwasher, refrigerator, microwave, Flex Brew coffee maker (Keurig AND full pot), slow cooker, toaster and a blender for your frozen tropical drinks! The pictures advertised were updated in December 2015. As you can see, we strive to keep the unit up-to-date. NEW FOR 2013: Brand new FULL SIZE STACKED HIGH EFFICIENCY WASHER & DRYER, fresh paint, new interior décor and furniture, ceiling fan in the dining area and new sling style balcony chairs. Also the complex has recently repainted all corridors and exterior walls and has redone the entire pool deck with beautiful Travertine tiles for both the indoor & outdoor pools/hot tubs! NEW FOR 2014: New complete HVAC system, living room recliner, master bedroom furniture and additional decor updates. Complex updated all common area lighting with bright LED lighting and made updates to the North Tower indoor pool and pool area. NEW FOR 2015: Fresh paint and new plush carpet throughout the unit. 48" wall mounted flat screen TV and Blu-ray player in the living room. The complex opened a new ONSITE pizzeria and replaced all ice makers in the North Tower. NEW FOR 2016: New extra thick memory foam sleeper sofa mattress, addition of multiple energy efficient bulbs throughout the unit and in the kitchen replacement of and addition of multiple pots & pans, cutlery, dishes and new memory foam coordinating floor mats, complete exterior wall waterproofing and painting as well as all common area carpeting replaced, parking garage LED lighting installation and parking lot stripping. NEW FOR 2017: Installation of new bath faucets, new carpeting for both condo balconies, security guard and gate for front entrance for peak season, new beach cross overs for access to the beach, North Tower pool and lazy river resurfacing and the resort installed a BRAND NEW fire pit! PERFECT LOCATION: Our unit location on the 3rd floor will keep you from waiting for an elevator! The stairs are right beside our unit for a quick trip to the beach or pool, just 2 floors down... The parking garage is 3 levels high so you can walk right the unit and never have to wait in line for the elevators! PARKING IS NEVER A PROBLEM @ SEA WATCH. PROPERTY AMENITIES: Enjoy hours of fun in any of the 6 pools (2 indoor), 10 hot tubs (2 indoor), the 2 lazy rivers or the fire pit!! The indoor pools are heated year-round and the lazy river and outdoor pools are also heated in the winter for year-round enjoyment!!! Sea Watch also has DAILY ACTIVITIES available that range from day trips & golf outings, daily turtle races or arts & crafts projects to water aerobics & ‘cupcake bingo’. The activities change weekly and there are activities for everyone to do (some activities include a fee). Also on property there is a fitness center that is available for use for a fee, on-site restaurant & ice cream parlor in the north tower, Tiki bar by the north tower pool and a pizzeria located in the south tower. BEACHFRONT: The beach is just footsteps away whether you are interested in heading down or to watch from the balcony. There are no obstructions in your view or use of the beaches! The balcony across the front of the unit is 24 feet across with beautiful unobstructed views of the beach and ocean. And there is also a balcony off the master bedroom!! For all of our guests staying between Memorial Day and Labor Day we INCLUDE an umbrella and two beach chairs through the lifeguard as part of your rental… Just head down to the beach and sit right down!! We know that you will enjoy your Sea Watch vacation whether you're relaxing on the beach or experiencing the numerous activities that both Myrtle Beach and Sea Watch have to offer. Our brightly decorated condo will welcome you home after your long day of golfing, shopping or lounging on the beach. Come enjoy all Sea Watch and Myrtle Beach has to offer. 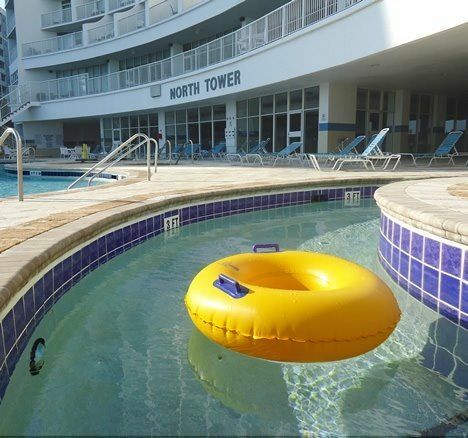 Sea Watch Plantation is filled with some of the best amenities in Myrtle Beach and has a great family atmosphere with plenty of activities from pools to daily group or off site activities!! Centrally located near shopping, Restaurant Row, many golf courses and so much more!! Also the complex is close to highway bypass @ 22 (within approx. 1 mile). There is plenty of things to do throughout Myrtle Beach, so why not be in the center of it all!!!! toilet, combination tub/shower, Master bedroom private bath. toilet, shower, Private bath in bedroom w/2 full sized beds. toilet, shower, Common/shared bath; adjoins hall & Queen bedroom. Bathroom #1, Master bedroom (King bed): sink, combo bathtub and shower, toilet, mirror, vanity, medicine cabinet, hairdryer, full sets of towels and soap. Bathroom #2, Double beds room and Bathroom #3, Queen bedroom: sink, shower, toilet, mirror, vanity, medicine cabinet, hairdryer, full sets of towels and soap. Central A/C (heat also available) - NEW UNIT FOR 2015 SEASON. Electric forced hot air (A/C also available) - NEW UNIT FOR 2015 SEASON. Included in rental rate, linens will be clean and on the beds when you arrive. Blankets provided for each bed. Linens & blankets are not to be removed from condo. Full sized high efficiency - NEW IN 2013. Full sized stacked - NEW IN 2013. Onsite resort FIRE PIT installed in 2017! Parking deck is attached to the North Tower building, three (3) floors of parking available. If parking on top level, you will not need to wait for the elevator as our unit is also on the 3rd floor. Wifi is included at no additional charge by the resort. Codes to use the WiFi will be provided in the check in documents as well as within the condo. Included in rental rate, towels are clean and hung up in bathrooms and kitchen. Beach towels are not included. Towels are not to be removed from condo. Available through resort, 2nd floor of North Tower. Four elevators in the North Tower, our unit is on 3rd floor: you may never need to use an elevator if you park on the top floor of parking garage & use the stairwell to gain access to pools/beach. Sleeper sofa, coffee table, recliner, two swivel barrel chairs, end tables, lamps, 48" flat screen TV, Blu-Ray player, access to direct ocean front balcony. Full size - NEW IN 2013. Full size (with freezer & ice maker). Hamilton Beach Flex Brew coffee maker: use Keurig cups or brew a full pot, w/auto shut off. Stove (full size), sink, microwave, refrigerator, blender, coffee pot (w/filters supplied), dishwasher (tablets provided), kitchen cabinet storage. Counter height dining table with six (6) matching counter height chairs. Kitchen has a breakfast bar with four (4) matching bar height chairs. Four (4) flat screen TV's: one (1) in each bedroom and one (1) in the living room. All have cable TV and DVD players (Blu-Ray in living room). Four (4) total: All bedrooms and one (1) in the living room (Blu-Ray player in living room). One master BR balcony. Also a 24' off living/dining rooms. Two sliders: direct ocean front, no obstruction to view of ocean/beach. Two clothes hangers/dryers are provided, do not hang towels from balcony railing. Sea Watch has an expansive patio/deck area around the pools, hot tubs and lazy rivers.... both indoor and outdoor with plenty of lounge chairs for sun bathing and relaxing. Nearby, Myrtle Beach is golf central USA! Sea Watch patrons only use the on site pools and hot tubs. Renters are supplied with pool passes for their stay. 8 pools: 6 outdoor heated, 2 indoor heated. All pools are open year round and indoor pools are enclosed November - March. 10 hot tubs on site: 8 outdoor, 2 indoor. All hot tubs are open year round and indoor hot tubs enclosed November - March. Sea Watch is located in the very popular section of Arcadian Shores. The complex is surrounded by well-kept homes and other high end condos. The beach is clean and best of all free! Although the complex is in a residential area you are still within 1 mile of Wal-Mart, Tanger Outlets, golf courses, restaurants and bars!! It is the ideal location for the ideal time away. Myrtle Beach is known for its great restaurants, beautiful beaches and friendly atmosphere. While staying at our unit you will experience the best of Myrtle Beach all within close proximity. If you are flying in, the airport is only 13 miles away. Fly in, short drive and relax sooner!! Myrtle Beach and Sea Watch Plantation is one of the most convenient vacations you may ever go on! !